I have been reading this new book, The Food Lab, by J. Kenji Lopez Alt. It’s more a science book than a cookbook… but the Engineer in me, loves that. It explains how food works, why it works… and why it doesn’t. If I can get through this 900 page tome, I’ll be smarter for it. While I’m only in the first chapter, Breakfast, I am learning all sorts of things about Eggs. Kenji’s style of writing is interesting, funny, and engaging. He explains the science in simple terms that anyone can understand. He uses experiments to debunk old wives tales and misinformation, and uses facts and data to support his conclusions. For instance, while talking about Eggs he explains the different cooking times and temperatures of both the whites and yolks, pointing out that at their different ideal temperatures (180F for whites vs. 145F for yolks) yields challenges for getting both just right at the same time. Mix in the variety of cooking techniques (boiled, poached, scrambled, and fried) you have a variety of perfect ways to cook the perfect egg – dependent on what is perfect to you. Kenji offers tables and charts to summarize his data and allow the reader to formulate their own personal preference. And while I am finding this all very interesting (I did say I was an Engineer), one particularly useful technique came out of his Egg section that I find fascinating and wanted to share. Kenji’s ‘recipe’ for hollandaise. I won’t explain the science behind this (get his book)… but his solution makes for the easiest hollandaise – and maybe the most consistent, delicious, and creamy version I have come across. Melt 2 sticks of butter until melted completely. Do not stir, allow the milk solids to rise to the top. Blend up egg mixture and slowly add melted butter, leaving milk solids in the pan. Continue to blend butter into egg mixture until butter is used up. I made up this hollandaise from start to finish in less than 5 minutes and topped over my Eggscellent Eggs (https://krittersmenu.com/2016/04/06/eggscellent-eggs/). Great technique to add to anyone’s repertoire for your hollandaise needs. We have recently taken on a new hobby of mushroom foraging. With the help of a club and mushroom experts (mycologists) we are building our confidence and pantries with mushroom goodness. You can read about our new ‘hobby’ here. We recently put our haul to good use with a Mushroom Fest Feast… a four course dinner centered around the different dried and fresh varieties we were collecting. So we invited friends and shared our wealth of goodness. Each of these course I labored over with great thought to try to best highlight the different mushroom types. All the mushrooms we collected ourselves. When I think of porcini, I think of that amazing beefiness that is the trademark of this amazing mushroom.. so why not pair it with beef. Chanterelles love cream, so why not make a crispy fried chicken and al-dente noodle that is fried to give it a crisp edge and crunch with this mushroomy voluptuous sauce. Risotto can be labor intensive, but it yields a super creamy intense texture and flavor when paired with the richness of mushrooms. I used dried porcini & morel + fresh porcini for this creamy rice side for our pork tenderloin. Mushrooms for dessert? Why not! This surprising dish WORKED! I was so impressed. It had texture, balance, and flavor in spades. It was really good. I used de-hydrated Cauliflower mushroom that I seared and sprinkled over the other components. It was delicious… who’d a thunk it?! This entry was posted in Food Stuff and tagged beef, cauliflower mushroom, chanterelle, foraging, mushroom, mushroom dessert, mushroom feast, porcini on August 17, 2016 by kritterspaw. I admit it. I don’t know how many different salts I own… but it’s more than a few. I have Australian Murray River sea salt, alder smoked sea salt, Jurassic salt, French fleur de sel, gray salt, maldon salt from the UK, and the list goes on. To non salt lovers it must sound weird. Why on earth do you need so many salts? The truth is I’m an addict! But really, they do taste different. I love doing salt tastings for novices… it’s a great eye opening experience for the uninitiated. Our first salt tasting that turned us on to the whole salt thing, many years ago before salt was ‘a thing’, was at none other than The French Laundry in Napa Valley. Yes, that French Laundry, Thomas Keller’s famous world class restaurant. The multi course meal was mind blowing. We were most of the way through it, and as much as I love salt, I never felt a need for it throughout the meal. But we came to this lovely lamb dish, and I wanted salt. My husband thought I was insane, asking for salt in such a fine restaurant establishment. But I wanted salt for the lamb, it needed it. When we asked for it we were convinced that the poor waiter would be shot on the spot when he went back into the kitchen and told of our need for salt. Instead, the same waiter appeared, unscathed, with a platter full of different salts. Each salt was in a different sort of container with a different spoon. One in a miniature silver terrene, one in a carved wooden bowl, etc. There was smoked salt, and red salt, and Jurassic salt. Oh my! He proceeded to put a little pile of each salt on a little plate for us, explaining what each was. Being my first exposure to such ludicrousy we were in love. We sampled each salt and lingered over that lamb course. To this day, I forget how the lamb was… but oh, that salt! It changed our lives! We actually pair salts to different foods. Smoked salt is great with grilled meats, but French fleur de del is great with grilled vegetables, etc. So when we saw this Omnivore Salt in Bon Appetit, we had to try it. I am pretty particular about my salt these days. I loathe the stuff in shakers, sold in cardboard containers. We bring our own salt grinder to restaurants… and I give away salt cellars to people whose homes we frequent for dinner. The Omnivore Salt is a ‘seasoned salt’. In other words, it’s not a salt from far reaching corners of the world, it’s a salt mixture. It’s mostly salt with seasoning… black pepper, chili pepper flakes, etc. as additives to the salt. The list of ingredients is vague, calling for salt and spices. But it’s a good mix. We like it. And for now, it’s the salt we are using. This entry was posted in Food Stuff and tagged french laundry, omnivore, salt, thomas keller on December 5, 2014 by kritterspaw. Costco sent out a flyer recently. Usually their flyers immediately go into the ‘recycle’ barrel. 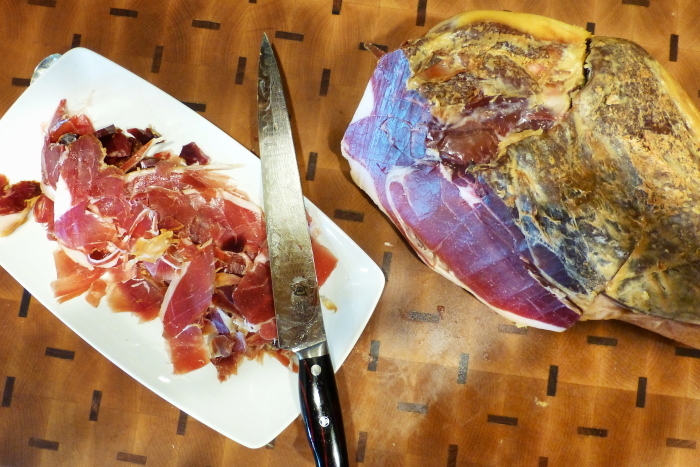 But this grabbed my eye… spanish ham, serrano jamon, to be exact… for sale through Costco, delivered to your door. A whole ham, enough to share with your favorite friends and family. It didn’t take us long to snag our ‘whiles supplies last’ jamon. Watch out the word is bound to get out, and lines may start forming out the door. Our maiden voyage, once we had the ham in house, took us all the way back to the tapas bars in Madrid, Spain. The simple taste of that salty, smokey ham with that luscious melt-in-your-mouth fat was so amazing and reminiscent of our tour through the cobblestoned streets of Plaza Mayor that is was like taking that trip all over again. Our conversations are all the sudden turning to our next European vacation. Go figure. This entry was posted in Food Stuff, products and tagged costco, jamon, madrid, serrano ham, spain on December 1, 2014 by kritterspaw.